It’s Day Four in Chengdu and thankfully we are finally rid of those early morning sessions which are highly inconvenient for the UK audience. What were they thinking putting them on at that hour? God only knows…surely China should be getting on board with us Brits and putting this on to suit our days rather than their own, very selfish if you ask me. 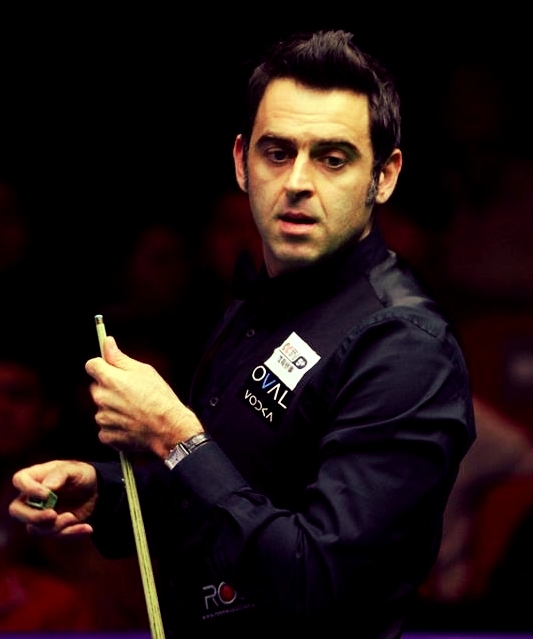 Anyway, Ronnie’s brief appearance in China was just that, brief, as he was beaten by Liang Wenbo from holding a 4-1 lead. Ronnie wasn’t at his best and China got to celebrate a home win. He can come home now knowing that he’s fulfilled his part of the bargain with the vodka boys so everyone’s happy. Earlier Ding had also got through and is still on for a hat-trick of titles, you have to go back to the days of a certain Mr Hendry for the last time that happened, but to me Ding did show a few signs of tiredness here and there and I don’t really fancy him to make history on that showing personally. The childcard beat Barry Hawkins, some have accused me of being unfair to the childcard in refusing to give him any credit for his performances. Well, I am nothing if not consistent so I will again refuse to praise the childcard for another win in a tournament he shouldn’t be in. I wasn’t up early enough to see Mark Allen play but apparently he struggled against dogged Dave Harold and amongst the shocks of the day were contrasting fortunes for the Welsh twosome of Matthew Stevens and Mark Williams. Matthew gave John Higgins a pasting, increasing my suspicion that we may be witnessing the end of an era with John, I just don’t see any glimpses of his steely resolve lately and haven’t done for a while, will he ever get it back? MJ lost to Kurt Maflin who now gets to have a crack at Dotty who ended Kyren Wilson’s run. There were also early wins for Joe Perry, Marco Fu and Dark Mavis, the latter of whom along with Neil Robertson and Stuart Bingham are still in the hunt for the outright bets. It’s fair to say that the match betting today didn’t go too well. Ryan Day managed to turn over Judd’s conqueror Angles and Fergal O’Brien, Mark Selby and Peter Ebdon all came through real snoozefests late on. Robertson’s 6-1 win over Un-Nooh is arguably a score that was easily predictable. It is also a score that betting markets pointed to before the match as well as silly odds being taken on Robbo just to win at Betfair. By the time the match started there had been over £40,000 traded there on that match alone, over 99% of which was on Robbo. This is not a great deal of money for sure when it comes to betting markets, but when there are people prepared to take odds as low as 1/12 on a player before a ball is struck in a match this will always raise alarm bells, particularly when the player being laid has ‘form’. Betfair arguably being the back end of activity which has long since gone on in the Asian markets. Ronnie’s televised match at the same point had less than £6000 traded on it. In short, this match was comfortably the most traded on of the week so far. It may well be that this is just merely a reflection of the confidence Robbo backers have in their man, but to me it smells a bit fishy and has similar patterns to other undoubtedly dubious matches involving Thai players. I can’t and won’t blame the players themselves and as I have said before the Integrity Unit face a thankless task, but this can’t just carry on. I hope that all firms and exchanges will soon take the decision to pull betting on all matches involving certain players, though what good this will do is unclear as it will merely push things further underground. It’s a real problem in the sport and I’m not at all sure how to solve it, I’ll just say that I’m glad it’s not my job to do so. But it should continue to be highlighted rather than ignored or else the baddies have won and my mum would not like that and would give me a severe telling off. Anyway, here is the line up for tomorrow. We still have main fancy Robertson involved and he seems to be playing as well as anyone, we also have the two 40/1 shots in Mavis and Bingham still in the hunt. Click on the match to view the head to heads where applicable. Recommended Bets: 2 point acca pays almost 9/2 at Ladbrokes on Robertson, Dott, Day and Mavis. 2 points on Bingham to beat Selby at 7/4 with Corals. Check out all Apollobet’s outright match prices here. Events 3 and 4 of this season’s Snookerbacker Classic saw us at a new venue in Liverpool, an old haunt of mine George Scott’s Snooker Club, or simply ‘Scotties’ to patrons of this famous old shrine to snooker. Scotties is synonymous with snooker in the North West and there probably isn’t a snooker player on the main tour for the past 30 years who hasn’t been there at least once. Famous faces adorn the walls, some photographed with the man whose dream the whole place was, the late George himself. It’s barely changed since I started going there for junior events as a kid along with the likes of Rod Lawler, John Timson, Colin Kelly and Nicky Fruin. So, as you might imagine I was very nervous staging my own competition there, filling such giant shoes as the late Ted Robinson, a man who put his heart and soul into snooker and after whom the refurbished matchroom is now named. Saturday started with us being led to a private room at the side of the main bar area which is like someone’s sitting room, it’s odd that I always knew the room was there but I don’t recall ever going into it before. Mrs SB set out the antique cake stand as the players started milling in. The mix was clear for all to see, local lads in some cases very local in the shape of Anthony Jeffers and Josh Mulholland who are regulars at the club as well as John Welsh, a player I remember well from my time playing and still a fierce competitor mixed with those who came from further afield, Billy Brown making the trip up from London, Mitchell Mann from the Midlands, Damian Wilks from Bradford and Callum Lloyd from Newport amongst others. First round highlights on Saturday included an eye-catching 4-0 win for Mulholland over Mitchell Mann and a marathon which saw Jeffers scrape past fellow Scouser Brian Robertson 4-3 in just under 4 hours. Both local lads also prevailing in the next round along with Welsh and Alex Taubman, giving the semi-finals a very local feel. Off the table, the sociable side of the Classic was once again in evidence, a bizarre conversation in the players room at one point touching on the highs and lows of being chosen to arrange Jimmy Savile’s funeral and the chances of recovering from an operation, for at least ten minutes this cosy sitting room was more like a relatives room at the local hospital but gladly it was all light-hearted and there were no further casualties. 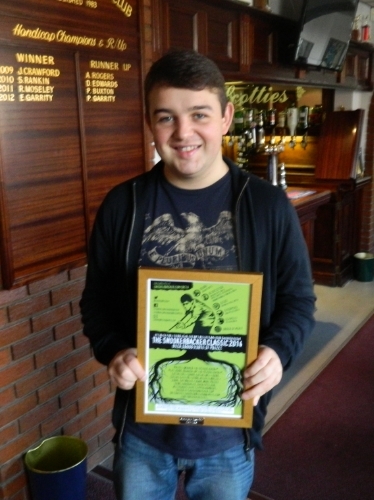 Anthony Jeffers with his prize. On the table it was Jeffers who came through to the final first with a hard fought victory over Alex Taubman, Anthony’s 86 break in the decider coming from a magnificent opening red and leaving Alex to simply hold his hands up at the end and claim he could not have done anything about it. A much more pedestrian affair in the other semi-final saw Welsh set up an all Liverpool final with a 4-2 defeat of Mulholland, who had given a very good account of himself on his SB Classic debut. The day was wearing on by now and it was clear we were in for a very late finish. Mrs SB had long since left the building and myself and referee Roycey were there for the late stint. This was a real clash of styles and old school man Welsh was not going to let the small matter of time put him off, he took the first but from then on Anthony began to take control of the exchanges and scored the heavier of the two, he was helped by two outrageous flukes to put him into a 3-1 lead but wrapped up the match in style and became the fifth man into the Finals as a result. You wouldn’t believe it by the picture but Anthony is actually 21, he has had such a long career that he told me he packed in playing seriously when he was 18 and started going out with the lads. He now claims to be bored of that and has decided to give the baize another go. He is clearly a very talented player and I think his best asset is his temperament, he doesn’t beat himself up and that is a much underplayed asset in the amateur game these days, he could well shock a few in March with his level headed approach. It was now time for Roycey and I to leave and arrive back at SB Mansions not long before midnight to be greeted by Mrs SB who had made a kings supper for the two of us, the grateful and hungry ref wolfing it down before we all made our way to bed, it had been a long day and we had another to come. The full results from Saturday can be found here. On Sunday we relocated to the main bar area and again the day started with a nice buzz around this famous old club. Myself and Roycey were suitably refreshed as was our other referee for the day Rob Spencer from Stockport who had also been there until late the previous evening. Mrs SB again made everyone feel at home with cakes and a smile and a very funny discussion ensued involving somebody known as ‘Jimmy the Twitch’, a man known to one of the players who let’s just say has his very own brand of twitchy snooker and some tall tales to tell. There were three unavoidable withdrawals and with Jeffers through the previous evening, a bye for his would-be opponent Brian Robertson, thus avoiding a second four hour tussle between the two locals. The undoubted highlight of the first round was the performance of a rejuvenated Mitchell Mann, who shook off his 4-0 drubbing of Saturday to knock in two centuries on his way to a 4-1 win over the dangerous Chris Keogan from Sheffield. It was clear that he meant business with an extremely impressive performance. Gaz Allen flew around the table at breakneck speed to account for Neal Jones in a very decent match which finished 4-3 in just under two hours, Taubman’s impressive weekend continued as he accounted for Damian Wilks and Newport’s Callum Lloyd strengthened his lead at the top of the Order of Merit list with a 4-1 win over Billy Brown. 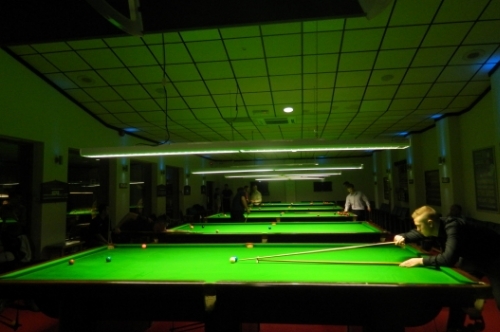 The club itself was buzzing with all the tables in the main arena full as we continued the tournament in the match room. I had been informed earlier in the week that a very special occasion was happening later on in the match room so I was pleased that the players were getting on with it and also looking forward to moving into the sunken Clare Room for the final stages. The quarter finals saw wins for Mann, Mulholland, Lloyd and Robertson, who came through in a nailbiting decider against Gaz Allen which went to a re-spotted black. Mann’s 4-2 win over Alex Taubman saw the highest break of the day, a 112 by Taubman which currently heads the highest break of this year’s tournament, which carries a £300 prize. Mitchell’s semi-final against Callum was a fairly one-sided affair and saw a third century for the man from Birmingham, it is the first time he has entered the Classic and was clearly really enjoying the occasion and rising to it. A former Junior Pot Black winner (beating Jack Lisowski in the final at the Crucible), he has a very nice way about him around the table which reminds me a little of Dave Gilbert, who he revealed is someone he admires and has had a few practice sessions with. His dad Jeff chatted to me after the match explaining that following a period of ‘blow-out’ from the game, Mitchell now seems fully focused again and like Jeffers the day before has a seemingly unflappable temperament. 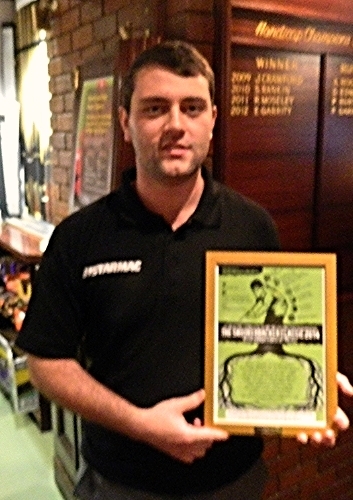 Brian Robertson won the all Merseyside semi-final down in the Clare Room, Josh Mulholland getting to his second semi-final and as a result putting himself into third place on the Order of Merit, 10 frames behind the leader Callum Lloyd. Brian produced a very impressive display and is a player that very seldom plays the wrong shot. The final was hugely entertaining and reminded me of Scotties in years gone by, hushed tones in almost total darkness and tension in the air in the corner of the Clare Room. The players did not disappoint with a very high standard of play and good scoring. Mitchell had divulged to me before the match that he really wanted to win to get hold of the framed winners prize which he wanted to put up in his bedroom, his dad Jeff asking for some posters from the tournament for his snooker room, the two were clearly really enjoying the event and the unique atmosphere this great venue creates. Brian battled hard but in the end Mitchell was just too strong and was the best player of the day and a deserving qualifier. He was clearly delighted at the win and expressed much praise for the venue, expressing surprise that it is not better utilized by other tournament organisers. Which I had to agree with. Mitchell and Anthony become the fifth and sixth qualifiers to Grand Finals Day next March, both are now just three wins away from Q-School and four away from being champion and earning a date with Stephen Hendry at the Crucible. They join Ben Harrison, Kishan Hirani, Jamie Clarke and Adam Wicheard who have already booked their place in the final 16. There was then just time to grab a quick drink with the referee for the final Rob, who thanked me for the weekend and said he had thoroughly enjoyed it, pointing in particular to the relaxed atmosphere that seems to now go hand in hand with the tournament, we raised a glass and then it was time to go home. For all the results from Sunday click here. I’d like to think that the Classic did bring something back to Scotties at the weekend. It’s a club I hold very dear to my heart having been there countless times with my late dad, playing in front of George himself many times as he watched on in his cardigan and slippers. The matchroom might have changed from it’s heyday but the atmosphere is still there, the Clare Room too remains unspoilt and has a feel all of its own. The feedback from the players I spoke with was hugely positive and I can only hope that this helps to catapult the club back to where it belongs as one of the UK’s finest snooker venues. Scotties is still thriving and it is testament to the place that the event I spoke of taking place in the Ted Robinson Matchroom was won by Fred England, a man who is sadly terminally ill, in front of a huge crowd and refereed by Pete Williamson. If you ever get the chance to pop your head around the door, please do, you won’t regret it. I will definitely be returning there next season and I hope more players will see what a great weekend of snooker this is. I thoroughly enjoyed every minute of it. Last but not least, a huge thanks to Geoff, Colin and all the staff for their hospitality and hard work to make the event a great success, to Martyn ‘Rolls’ Royce and Rob Spencer for their tireless work all weekend, to Andy at My Snooker Stats for his continuing genius and to the SB Classic family of sponsors. I must also thank the players for making this a very special weekend for me in my home city. It was also great to catch up with my old mate Neil Johnson, now one of the country’s leading coaches and a tireless crusader of junior snooker in Merseyside, Neil is a man who if you cut him in half would have ‘snooker’ written right through him. Visit and become friends with Scotties Snooker on Facebook by clicking here and scroll down the photo page to see the famous and familiar faces that have passed through it’s doors down the years. To get some idea of what the matchroom was like in the 80’s here is some archive footage from a BBC programme from the time. 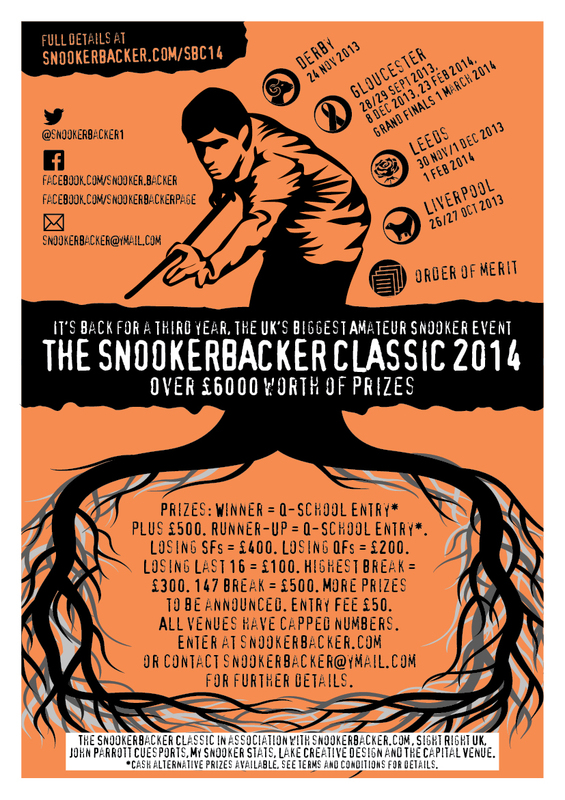 You can see all the results so far of this year’s Snookerbacker Classic by visiting the Score Centre here which also shows the current standings in the Order of Merit list, Callum Lloyd currently heading the chasing pack with 28 frames under his belt, the top two on this list who don’t qualify for Grand Finals Day automatically will get the last two places in the Finals on March 1st.